Size matters not. Or does it? For those of you who are most concerned with how you're going to fit all these next-generation consoles into your house, here's a pair of nifty charts showing the relatives sizes of Xbox 360, PlayStation 3, and Nintendo Wii, compared to their current counterparts. The Wii ranks in as the smallest of the lot, with a bare 14 centimeters in width (just two centimeters wider than a CD/DVD), less than 20cm long, and only 3.5cm high. 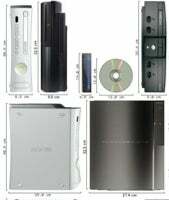 The heavyweight of the group is, somewhat to my surprise, the PS3, which comes in at an impressive 9.8cm high, 27.4cm long, and an astounding 32.5cm wide, beating out by a hair's breadth in every dimension, the previous champion, the original Xbox. Good to know that $600 is going towards something substantial .